Mein Kampf by Hitler is topping political best-seller lists for e-books. 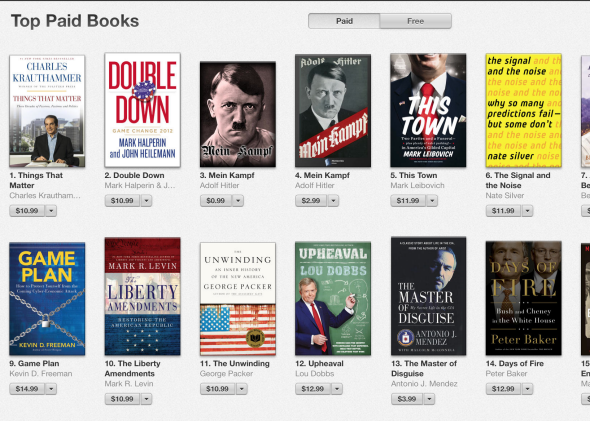 In 2013 Mein Kampf often appeared on the list of most popular paid politics and current events books sold on iTunes. Godwin’s law predicts that Internet chatter should be riddled with references to Hitler and Nazis. And it often is. But 2013 was an unusually popular year for e-book versions of Mein Kampf. Two editions of the 90-year-old work are currently holding down third and fourth most popular spots on the “politics and current events” list on iTunes. On Amazon Mein Kampf is currently 12th on the Politics & Government best-seller list and, less surprisingly, No. 1 on the Propaganda & Political Psychology sub-list. Indeed, there is always a certain amount of academic interest in Mein Kampf, but its sales in 2013 were unusual. Faraone attributes last year’s popularity, at least in part, to the $1 Kindle version that tops the Amazon lists and was released last January by Elite Minds Inc. The president of Elite Minds told Faraone that, “Sales are great,” but that there is “a moral dilemma in promotion.” Well, yeah. Mein Kampf’s rise may be similar to that of 50 Shades of Grey, which is thought to have been so popular as an e-book because it’s easy to read electronic copies discreetly. Of course it could just be that at 700 pages long, Mein Kampf is finally manageable as an e-book. But either way, electronic distribution is giving the book a big sales boost.